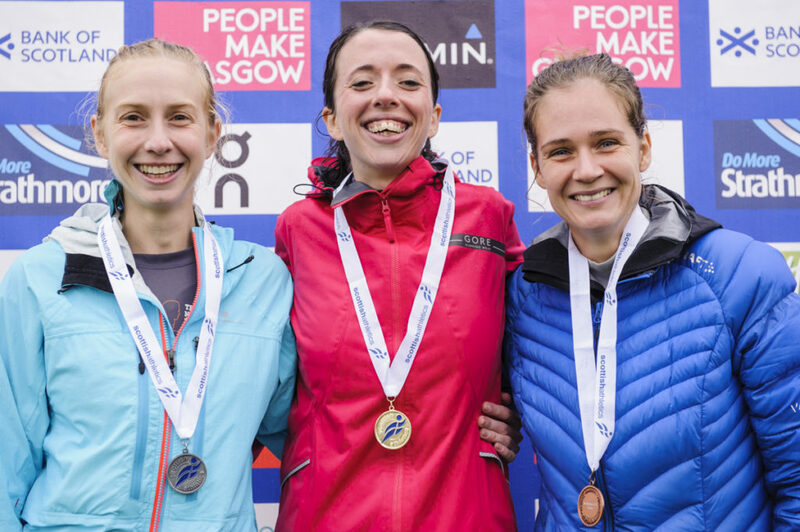 The Scottish Half Marathon championships were staged within the Great Scottish Run at a wet Glasgow last weekend with a good turnout of club runners. Callum Hawkins of Kilbarchan AAC and Fionnuala Ross of Shettleston Harriers took the Senior titles and we’ve already reported on the top three in the main individual categories in our Great Scottish Run round-up. 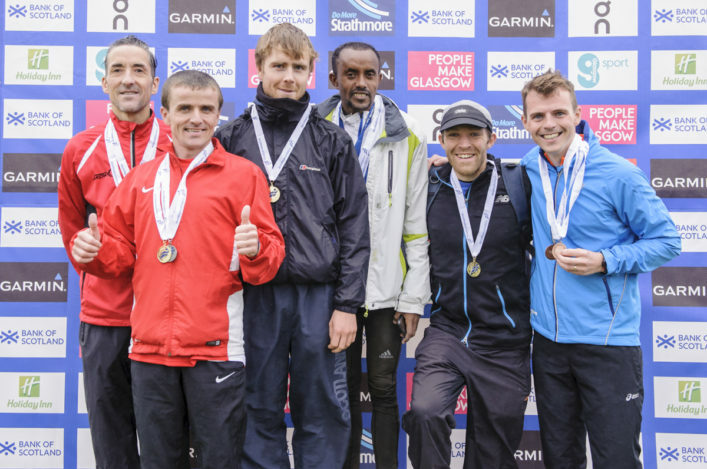 Now we can confirm other Scottish Half Marathon medallists in terms of the Masters medals and the team medals. 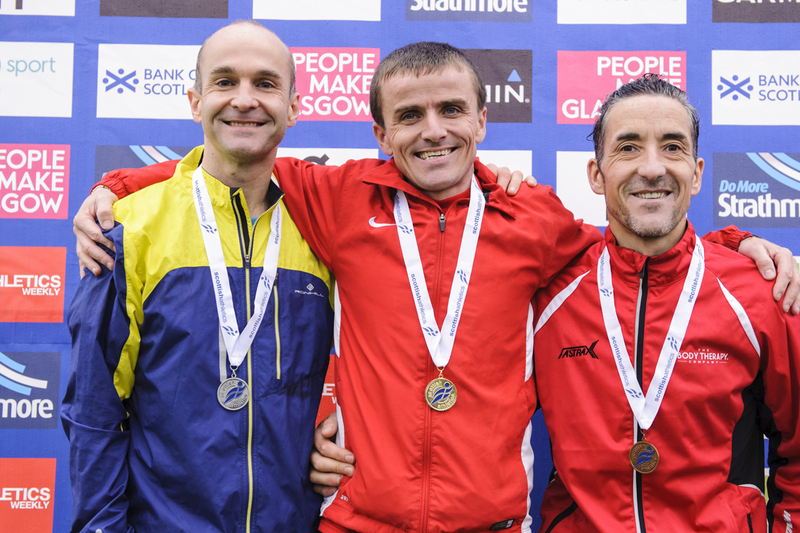 Robert Gilroy of Cambuslang Harriers won the Men’s Masters gold with Central AC’s Scott Brember taking the silver, with a big PB for the half marathon, and Kerry-Liam Wilson of Cambuslang landing the bronze. Edinburgh AC athlete Lyndsey Fraser won the Women’s Masters gold with Rhona Anderson of Dunbar the silver medallist. Jennifer Reid of Cambuslang completed the podium with the bronze. In the Men’s team race, victory went to the Shettleston Harriers trio of Tsegai Tewelde, Ben Johnson and Lachlan Oates. Shettleston won it from Cambuslang (Gilroy, Wilson, Ian Reid) and Edinburgh AC (Neil Renault, Stuart Johnston, Callum Reid). In the Women’s team race, the golds are headed for the Bellahouston Road Runners (Catriona McDonald, Romy Beard, Katie Mathieson). Bellahouston Road Runners won from Glasgow University (Kirsty Dickson, Laura Stewart and Katrina Ballantyne) and Fife AC (Katie Jones, Jennifer Cruickshanks and Mhairi Boyle). Congratulations to all the medallists involved and to the clubs mustering teams for the Scottish Half Marathon championships. (Please note the Women’s team result remains provisional as we check a couple of issues). *The Road Race Grand Prix for 2017 is now concluded. We will look to confirm the final number of shares for the £4000 prize-money in a separate story on here in due course.